Preheat oven to 450°F with rack placed in middle position. Combine the rhubarb, strawberries, 2 tablespoons sugar and a pinch of salt. Spread on a rimmed baking sheet and roast until softened (about 10 minutes); let cool. Beat the cream in a small bowl with the remaining tablespoon of sugar and rosewater until light and fluffy; set aside. Combine the ice cream, milk and all but 1 tablespoon of the rhubarb mixture in a blender and process until smooth. 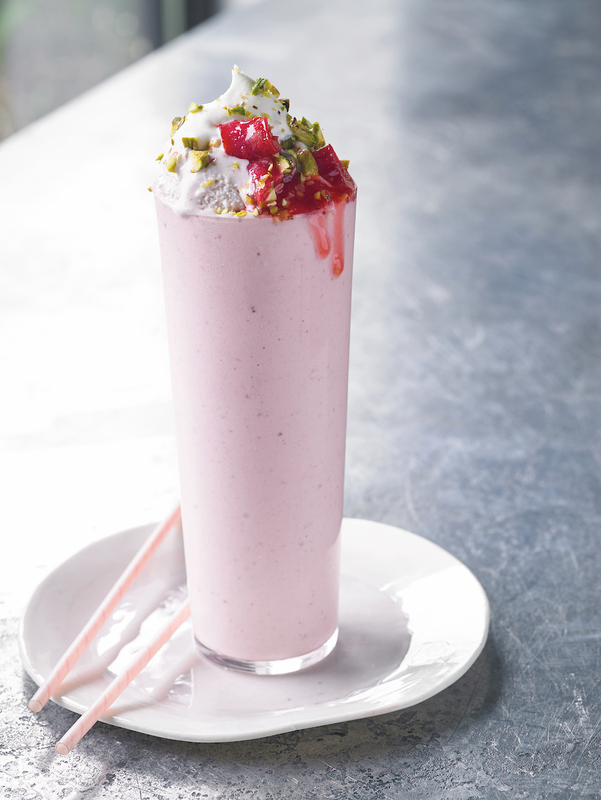 Pour into a chilled glass, top with the remaining rhubarb and whipped cream, and sprinkle with the pistachios.